This study aims to develop a cost-effective air pollution monitoring tool using lichens, with the scope of identifying effects of heavy-metal pollution associated with coal-power generation in jarrah forests in Collie, South-west Western Australia. Lichens are a symbiotic relationship between algae and fungi and are very effective biomonitors. This visual conceptual model outlines the concepts used and steps taken to achieve the overall thesis aim, i.e. 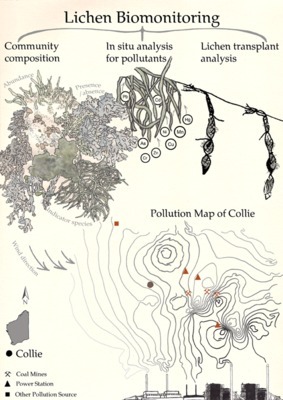 to prove the effectiveness of using lichens as biomonitors to explore heavy-metal air pollution patterns in the Collie air-shed. This visualisation will be used in the researchers thesis.